Opera lovers are people who crave a great story, just like bookworms crave a page-turning novel to devour. I often wonder, when I watch a movie or TV show or read a book, how some of my favourite stories would translate into an operatic telling. The Royal Opera House wondered this too, on World Book Day, and they reached out to Twitter for answers. Operas adapted from books aren’t a new idea; Jennifer Higdon’s opera Cold Mountain is based on Charles Frazier’s award-winning novel of the same name, and Lorin Maazel composed 1984 based on Orwell’s classic. Of course, not every work of fiction lends itself well to the addition of music; an operatic Finnegan’s Wake might not be boring, but it may miss the point. Authors like John Irving write compelling characters (I could read The World According to Garp a hundred times), but they’re developed over the long-haul, over a scope that’s not conducive to the way opera tells stories. The same goes for delicious epics, like Harry Potter, The Lord of the Rings, A Song of Ice and Fire, and even Diana Gabaldon’s Outlander series; there are opera-sized events in these books, and though there’s potential for Wagner’s-Ring-Cycle-like operatic takes on them, there’s likely too much detail involved to really do justice to their complex webs of plots and characters. Still, some of our favourite books, and the characters in them, seem perfect for an opera. Examples, you ask? William Golding’s 1954 novel was a staple of high school English class, a commentary on humans, society, and whether or not people think for themselves and feel empathy for others. It’s already been adapted for the stage by Nigel Williams, and Lord of the Flies would be an amazing ensemble opera. In a story with so many symbols, there are huge opportunities for musical motives (French horn as conch shell?) and Britten-like personalities among the boys. Very Billy Budd, but on a beach. Piggy could be a character tenor, with baritone Ralph taking on the role of island government. Jack Merridew could be one hell of a countertenor role. Plus, there are three choirboys; I mean, come on. 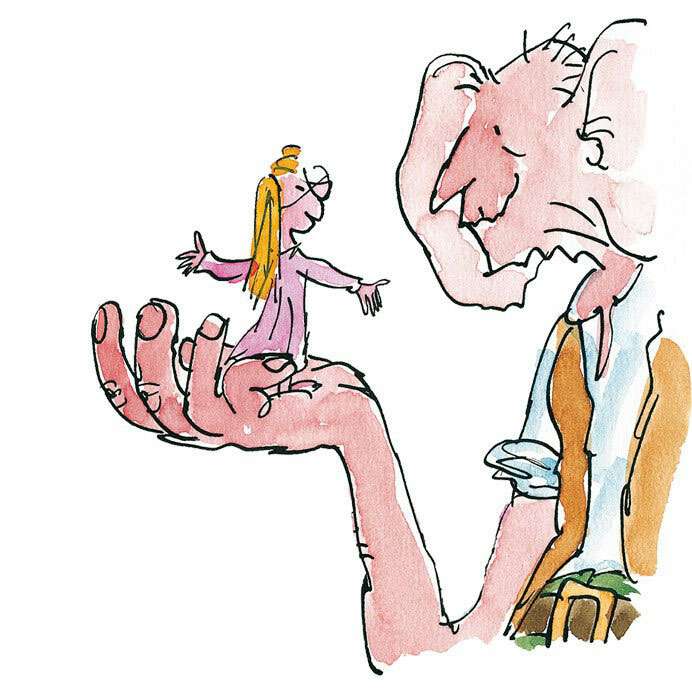 One of the cornerstone stories of my childhood, Roald Dahl’s 1982 children’s book, The BFG (short for Big Friendly Giant), would make a beautiful opera for audiences of all ages. Perhaps the next great soubrette role could be Sophie, the little orphaned girl who gets plucked out of her bed one night by the BFG (but also rescued from the mean lady at the orphanage, Mrs. Clonkers). The Giant himself could be a glorious bass, a little like the title character in Massenet’s Don Quichotte. There are mean giants, too; the Bloodbottler and the Fleshlumpeater are potentially the Fasolt and Fafner of the 21st century. Illustration by Quentin Blake, from Roald Dahl’s The BFG. True, there’s a Broadway musical based on Bret Easton Ellis’ 1991 story of New York City yuppie society and what the game does to the hardest of players. The music could be a cool, intertwining homage to some of Bateman’s favourite artists, like Huey Lewis & the News and Phil Collins. I hear Patrick Bateman as a piercing bass, sort of like the cold steel in John Relyea’s voice. Find a coloratura soprano for his girlfriend, Evelyn, a mezzo for his secretary, Jean, some lyric soprano lines for his women of the night, and an endless trail of clone baritones to sing Timothy Price, Paul Allen, and every other faceless Wall Street guy in a great suit and a white business card. Speaking of which, can we get someone to write “The Business Card Quartet”? Patrick Bateman belting out a high note. Another opportunity for some cool ensemble writing could be an operatic version of Alex Garland’s 1996 novel, The Beach. There’s a noble quest to find a better society, making the protagonist some sort of naïve leading tenor. There’s an ambiguously benevolent “tribe” leader named Sal, perhaps singing with a very Mother-Superior type of rich mezzo. Plus, a pack of colourful backpackers, sung by comprimarios of all fachs, making up the isolated colony in Thailand with high hopes of utopianism. Very kumbayah-gone-wrong, with a globe’s worth of musical references within the international group of world-travellers. “Trio of the Three Swedes”, anyone? It’s true that opera might be a difficult genre in which to tell the entirety of Hunter S. Thompson’s drug-fuelled, quasi auto-biographical romp through Nevada. Yet, I see it as a hazy story, with the music taking on the brunt of the surrealist, blurred reality of Raoul Duke and his attorney, Dr. Gonzo. Think about it: bizarre duets in that desert-bound convertible, casino sounds morphing in the LSD fog, and the potential for a chorus of porcine police officers. It should probably be written by Mark-Anthony Turnage, too. Illustration by Ralph Steadman, from Hunter S. Thompson's *Fear and Loathing in Las Vegas*. What books would you like to see turned into an opera? Let us know in the comments below!